With a cult celebrity following, stars such as Gigi Hadid and Anne Hathaway represent Simkhai’s feminine designs on the red carpet. Simkhai’s style is modern and directional, with collections featuring beautifully romantic evening gowns and sophisticated cocktail dresses. His designs are simple and versatile and ultimately flatter the female form. Featuring cold shoulder necklines, asymmetric hemlines and sweeping floor length gowns full of rich texture and heavy beading. Shop his latest collection and add a bit of drama to your next cocktail party or formal event. 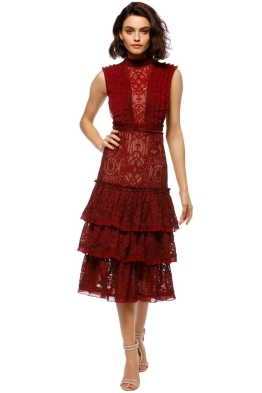 Romantic Chic Dress - I didn’t want to return it! Got so many amazing compliments wearing this dress. Beautiful colour and the fabric was devine. I didn’t want to return it! Me being quite short (160cm) the length was perfect for a black tie event. I’ve rented a couple of times now with Glamcorner and am hooked - they make the process so easy and I love being able to wear high end dresses for a fraction of the price.